In countries around the world, women are more likely to be diagnosed with depression and to attempt suicide. So why is the male suicide rate still several times higher than female? Six years ago my brother took his own life. He was 28 years old. Tragically, suicide is not as rare as one might think. In 2016, the last year global data is available from the World Health Organization (WHO), there were an estimated 793,000 suicide deaths worldwide.Most were men. In the UK, the male suicide rate is its lowest since 1981 – 15.5 deaths per 100,000. But suicide is still the single biggest killer of men under the age of 45. And a marked gender split remains. For UK women, the rate is a third of men’s: 4.9 suicides per 100,000. It’s the same in many other countries. 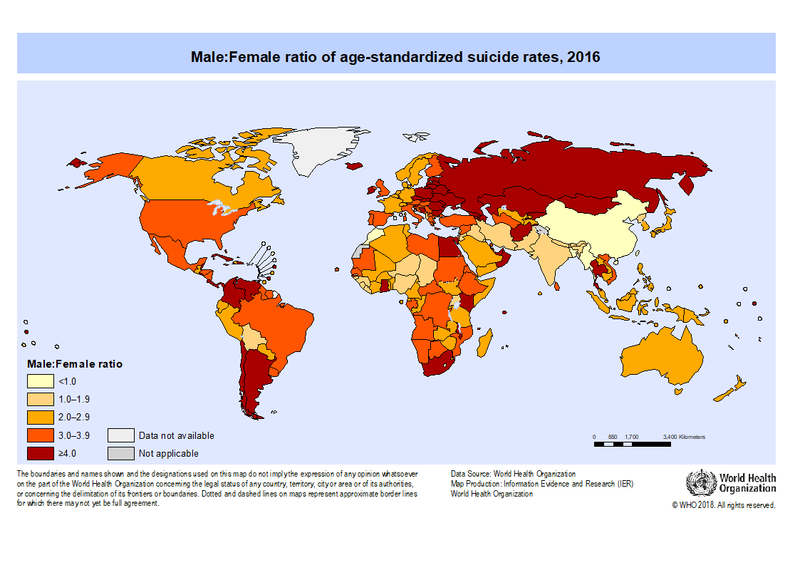 Compared to women, men are three times more likely to die by suicide in Australia, 3.5 times more likely in the US and more than four times more likely in Russia and Argentina. WHO’s data show that nearly 40% of countries have more than 15 suicide deaths per 100,000 men; only 1.5% show a rate that high for women. The trend goes back a long way. "As long as we've been recording it, we've seen this disparity," says psychologist Jill Harkavy-Friedman, vice-president of research for the American Foundation for Suicide Prevention, a health organisation that supports those affected by suicide. Suicide is a hugely sensitive, complex issue with a tangled multitude of causes – and the very nature of a death by suicide means we can never fully know the reasons behind it. Still, as mental health awareness has grown, there is greater public understanding about potential contributing factors. One of the questions that has persisted, though, regards this gender gap. It seems especially large given that women tend to have higher rates of depression diagnoses. Women also are even more likely than men to attempt suicide. In the US for example, adult women in the US reported a suicide attempt 1.2 times as often as men. But male suicide methods are often more violent, making them more likely to be completed before anyone can intervene. Access to means is a big contributing factor: in the US for example, six-in-10 gun owners are men – and firearms account for more than half of suicides. Can blue lights prevent suicides at train stations? Men may also choose these methods because they’re more intent on completing the act. One study of more than 4,000 hospital patients who had engaged in self-harm found, for example, that the men had higher levels of suicidal intent than the women. Why are men struggling – and what can be done about it? One key element is communication. It’s too simplistic to say women are willing to share their problems and men tend to bottle them up. But it is true that, for generations, many societies have encouraged men to be “strong” and not admit they’re struggling. But men may be less likely to admit when they feel vulnerable, whether to themselves, friends, or a GP. They also can be more reticent than women to see a doctor. A UK British Medical Journal study found general primary care consultation rates were 32% lower in men than women. (Consultation rates for depression, assessed by whether patients received antidepressant prescriptions, were 8% lower in men than women). "Men seek help for mental health less often,” Harkavy-Friedman says. “It's not that men don't have the same issues as women – but they're a little less likely to know they have whatever stresses or mental health conditions that are putting them at greater risk for suicide." If a person is not even cognisant they have a condition causing their distress, then they’re less aware anything could be done to help them. Only a third of people who take their own lives are in mental healthcare treatment at the time, says Harkavy-Friedman. Dangerously, rather than seeking help through established channels, some men may attempt to “self-medicate”. "There tends to be more substance use and alcohol use among males, which may just reflect the distress they're feeling – but we know it compounds the issue of suicide," says Harkavy-Friedman. Indeed, men are nearly twice as likely as women to meet criteria for alcohol dependence. But drinking can deepen depression and increase impulsive behaviours and alcoholism is a known risk factor for suicide. Other risk factors can be related to family or work. When there's an economic downturn that results in increased unemployment, for example, there tends to be an associated increase in suicide – typically 18-24 months after the downturn. One 2015 study found that for every 1% increase in unemployment there is a 0.79% increase in the suicide rate. Having to worry more about finances or trying to find a job can exacerbate mental health issues for anyone. But there are elements of social pressure and identity crisis, too. "We're brought up our entire lives to judge ourselves in comparison with our peers and to be economically successful,” says Simon Gunning, the CEO of Campaign Against Living Miserably (Calm), a UK-based award-winning charity dedicated to preventing male suicide. “When there are economic factors we can't control, it becomes very difficult." There can also be a spiralling effect. In the US, for example, health insurance often is linked to employment. If a person is being treated for depression or substance use, they may lose that care when they lose their job. Another risk factor is a sense of isolation, as physician Thomas Joiner writes in his book Why people die by suicide. This can manifest itself in every walk of life. The outwardly successful professional who has prioritised career advancement to the detriment of all else, including social relationships, may find himself "at the top of the pyramid, alone,” says Grunau. Of course, it is important to remember that while an external factor might precipitate suicidal behaviour in a person who's already at risk, it’s never the sole cause. “Millions of people lose their jobs, almost all of us have lost a relationship and we don't end up dying by suicide," says Harkavy-Friedman. There are no straightforward fixes for an issue this complex. But a number of programmes, policies and nonprofits are making inroads. In Australia, for example, mental health and suicide prevention groups are trying to shift the cultural paradigm. One initiative that has gained traction is RU OK? day, which encourages people to support those struggling with life by starting a conversation. Another approach is the “shoulder-to-shoulder principle” – encouraging men to talk while otherwise occupied, like watching football or going for a bike ride. Mates in Construction, a training and support programme, raises awareness of high suicide rates in the industry and shows construction workers how they can help be part of the solution. Overall, there's an emphasis on "making it okay for men to talk about how they're feeling – and for that to be acknowledged as a sign of strength”, says O’Driscoll. Technology is presenting new options too. Not everyone might want to unburden themselves to another person, even over a helpline. But artificial intelligence – such as chatbots – might allow a vulnerable person to communicate and get the help they need without fear of judgement. Another strategy is to focus on the impact a suicide has on loved ones. Calm’s campaign Project 84 – so named to represent the 84 men who die weekly by suicide in the UK – stresses the devastation left behind. This can counteract the sense by some men that "it's the ‘right’ thing to take themselves out of the equation", Gunning says. He emphasises: "Staying is always an option." Other solutions have to do with simply making suicides more difficult to complete. After barriers were installed on the Clifton suspension bridge in Bristol, England, for example, one study found that deaths from jumping the bridge halved – and there was no evidence that suicides from jumping from other sites in the area increased in response. Still, more work obviously has to be done. O’Driscoll compares how there’s often more attention paid to reducing road fatalities than to suicide prevention, despite suicide taking more lives. In Australia, for example, the overall suicide rate in 2015 was 12.6 per 100,000 – the highest rate in more than a decade –compared to 4.7 per 100,000 for road deaths. More research is needed too. “Clearly,” says Harkavy-Friedman, “there are differences between women and men in our biology, our hormonal structure and the way our brains develop and function.” But men and women are often studied together, and despite attempts to statistically control for the differences, it is not enough. She believes we need to study men and women separately. But there are positive signs. Harkavy-Friedman notes a huge change on the professional side, recalling at the beginning of her career it was hard to get a paper accepted on suicide because it was thought that you couldn't prevent suicide, she says. Now, we know that to be wrong. She also points to more government involvement than ever before. On World Mental Health Day in 2018, the UK government announced its first suicide prevention minister. "The UK has been ahead of the game, every step along the way," she says, adding that she believes there has been a decrease in the UK suicide rate because a national strategy has been implemented. For Grunau too, the situation is unquestionably getting better. "We are seeing momentum we've never seen,” she says. “You can actually talk about suicide and people still flinch, but they're more willing to have the conversation." That has had positive effects, as the decline in UK suicides shows. Still, it’s not enough. Any life lost to suicide – whether male or female – is a life too many. If you or anyone you know is affected by this story, here are some resources that can help. The Campaign Against Living Miserably (Calm) offers support to men. Call 0800 58 58 58 between 17:00 and 00:00 every day or visit their webchat page here. Call Lifeline on 13 11 14 or chat online, nightly seven days a week. If you are in crisis, call 1-833-456-4566 (4357) or text 45645. For more information about suicide prevention, visit Centre for suicide prevention.